Throughout this fall and winter, we have frequently asked ourselves, "what were we doing last year at this time when we lived in Barcelona, Spain." We miss Spain every day. I thought I would share some photos and thoughts from where we were last year. 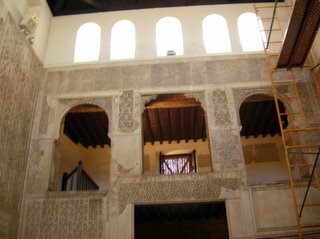 For Christmas, 2004, we gave ourselves a trip to Cordoba and Granada. These two cities were seats of power of the Muslim rulers of these areas more than 1000 years ago. I strongly recommend the book "Ornament of the World" by Ana ? 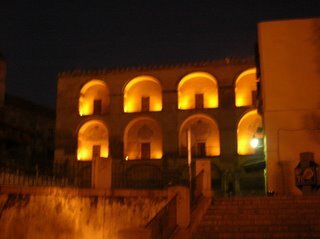 Menocal. Her book tells the history of when Jews, Muslims and Christians lived together in southern Spain, in mutual respect. We took an overnight train to Cordoba and arrived before 6:00 a.m. We had the city to ourselves, and strolled around taking photos, enjoying the quiet. Barcelona, as beautiful as it is, is a very noisy city, at all hours. 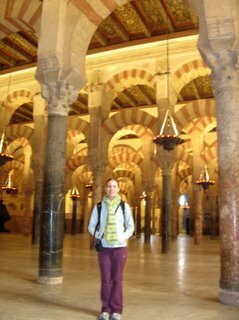 Here is dawn at the back of the Mesquita, a huge mosque. The Catholic Monarchs, Ferdinand and Isabela, expelled the Jews and Muslims from Spain in 1492. Yes, this is the same couple who funded Columbus' voyage in the same year! After killing and torturing thousands (F and I were patrons of the Inquisition as well) they expelled the remaining non-christians, and kept their riches. At any rate, this beautiful mosque was converted to a Catholic church, which it is today. Actually, the mosque was built on the site of an old catholic church, purchased by the Muslim ruler. 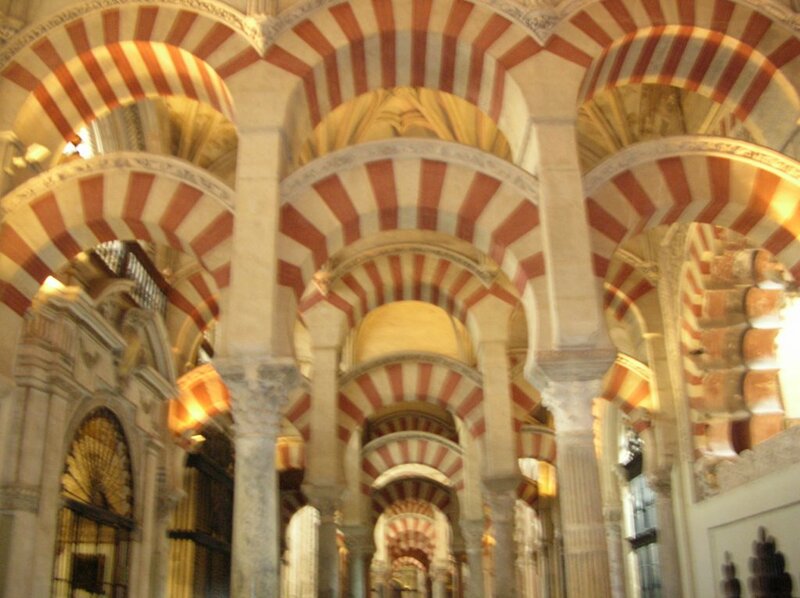 He began the mosque, using old pillars from that church and elsewhere, to support the gorgeous red and white arches. 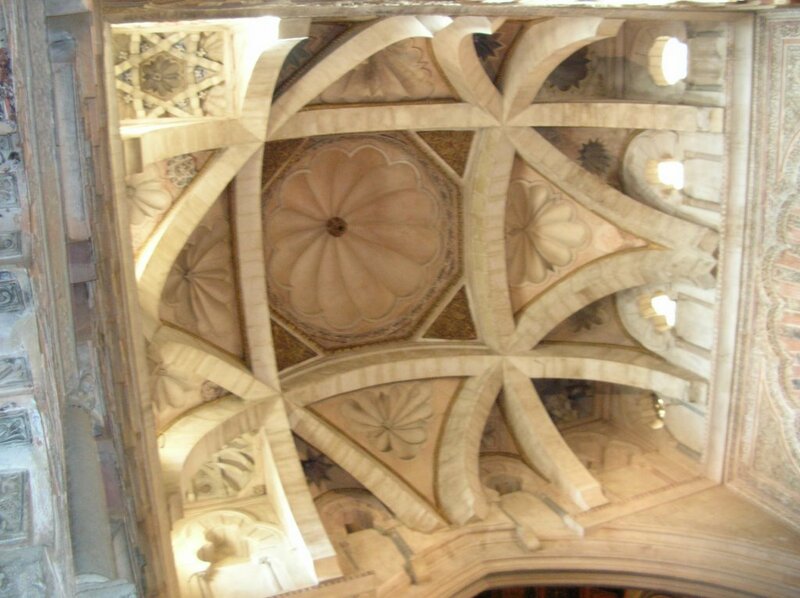 This dome, once the roof of a sacred part of the mosque, is now over a smaller Christian chapel within. And, our favorite travelling teen age travelling companion, adding another decorative element to the mosque/church. 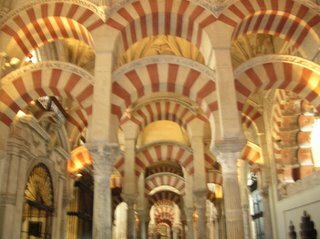 Because we were there so early, there was NO ONE else in the Mesquita with us!!!! No other tourists! Cordoba also has one of three Jewish synagogues to have survived F and I's purge. It was used as a shoe makers shop, as I recall, and was only recognized as a former synagogue centuries later. Here it is. Walking around Cordoba opened my eyes even more to the tragedy of our current world situation and the ongoing fight for moral and religious superiority. 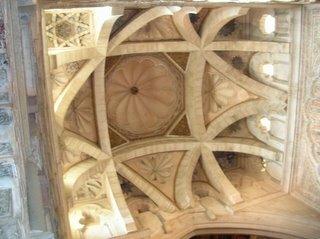 Give yourself a present this season; find and read Menocal's book; ponder Cordoba's history. I have that Menocal book but it's still in the "to read" stack. I love your Spain pictures, they make me wish I was back there! A ver si vuelves pronto y podemos conocerte!